Love, loss, irony, and humor abound in the lives of eight families living around Loon Lake, a shallow fishing spot in Northern Michigan. Wells' "use of language is like music," critics says, while others call her writing "a rich and varied drug," and that these stories convey "a real sense of the contradiction and the ambivalence that goes on within the family circle...through writing that has a lyrical style." Whether it's the story of a young dreamer and a bully, a man looking forward to retirement and the family that stands in his way, a teacher facing ethical choices, or a family coping with disaster, these stories delight. I'm a lover of short fiction (as I'm sure everyone is already aware) and having loved Jess Wells's other works (especially A Slender Tether), this was an instant choice for me, and perfectly timed. It became a wonderful companion on an overnight flight to the UK. Often in collections, the stories might touch each other thematically, but sometimes not even that comes together. 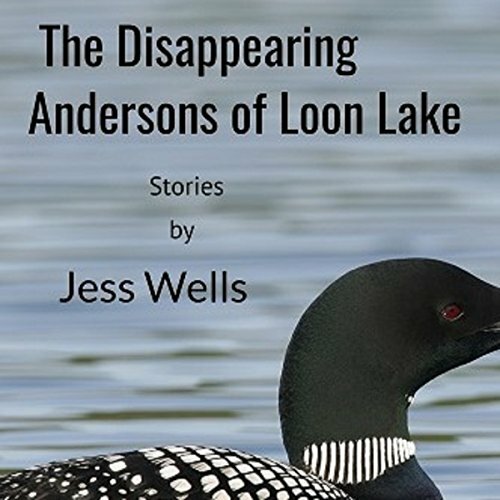 Not so in The Disappearing Andersons of Loon Lake, where each story was a lovely complement to those that came before. I caught myself with a little smile on my face at the end of most of the tales: there's a gentle humour at play here, and—again—while flying across the ocean, it was a welcome respite indeed. I listened to this book on audiobook, so I should add that it's such a joy to listen to a book narrated by the author when the author is so gifted at performance.